Suzuki 450 ATV King Quad - Is it a Best Buy 4x4 ATV? The Suzuki 450 ATV called the KingQuad seems to get rave reviews from most owners. But is that enough to call it a Best Buy in the 4x4 ATV class? Let's take a look at this popular Suzuki four wheeler. You can check out the video first to get a good overview. Full size frame and running gear - Basically a 750 KingQuad with a smaller engine. Good for full sized adults that want a mid-size engine. Also has room for large storage areas in both front and rear. Nice size tubular racks front and rear adds to the storage capacity. 4 wheel independent suspension - Has a more comfortable ride and better traction in the rough stuff. Shocks have 5-way preload adjustment so you can keep the ride height set depending on the amount of weight you're carrying. Low center of gravity - The fuel tank is located under the seat and to the rear. The engine's cylinder is tilted forward at an angle. Without getting too technical - when the heavier components of the quad are kept low - it reduces the "tippy" feel of this Suzuki 450 ATV. The lower engine also allows a lower seat height which enhances stability and just feels better. And speaking of the seat, Suzuki has a good one on the KingQuad 450. Narrow at the front and wide at the rear - just like a seat should be. Selectable 2 wheel drive, 4WD, and front differential lock - On this Suzuki 450 ATV you can select which drive mode you want to use with handlebar mounted electric switches. Use 2WD for most casual riding. Push a button for 4WD (This engages a torque sensing limited slip differential). If you want all four wheels driving at the same time - Push a lever up and you have all the pulling power possible. CVT automatic transmission with engine braking system - Suzuki has one of the best CVT trannies out there. This one has forward high and low ranges, neutral, and reverse. It provides engine braking seamlessly to help with those steep downhills. Without this handy feature - you would have to ride the brakes harder - and that just makes things way more tense than they should be! The gated shifter is on the left where I think it should be. It's so much easier to shift with your left hand while having your right available for throttle and brake control. Single cylinder, 454cc liquid cooled and electric fuel injected engine - Yeah, it may be a little small on paper. But like they say - don't knock it until you've tried it! It's easy to start and has good throttle response almost all of the time. This Suzuki 450 ATV has one of the widest powerbands in the class. Good low end pulling power for chores and enough left at the top end to stay right with your buddies on the trails. All with a secure feeling of complete control. That's why a lot of times - it's the mid size ATVs that get through the rough and tight stuff the best. They're just easier to manage and inspire more confidence than their big bore brothers. 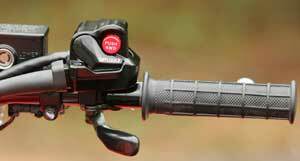 Front disc brakes with sealed rear brake - Adding to that feeling of control are the twin front disc brakes. Rear brake is a virtually maintenance free, sealed unit mounted inboard to the front of the differential. It works like a wet plate clutch - and it works well! Suzuki says it's designed to last the life of the quad. 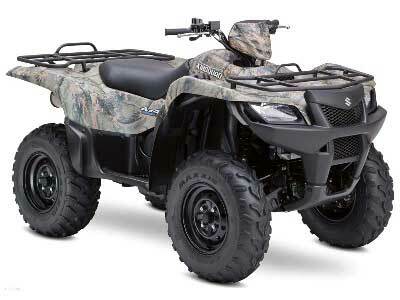 Suzuki's 450 ATV King Quad in Camo. Pros - Suzuki was the first to build a four wheeler in the 1980s and the King Quad line has been around since the early 1990s. That means they've had a lot of time to see what works - and tweak it to work even better. There really is nothing spectacular on the spec sheet about the 450 King Quad. What is spectacular is how well it does everything and how comfortable it is for the rider doing it. Lots of owners commented on how they could ride this Suzuki 450 ATV on much longer rides with no problems. I think the roominess of a full size quad combined with the smooth, wide power of the 450 engine is the secret sauce. It's just makes it easier for most of us to get more out of the ATV without the intimidation factor of a big bore machine. Oh, and the price! A lot of quad for the money, and now there are some rebate specials on '07 and '08 models. Check it out at your local dealership. Cons - No recalls showed up so there weren't really any kind of serious problems. The most common complaints were the CVT belt getting wet and slipping and the lack of traction of the stock tires. Those complaints may have more to do with the type of riding you do than with the quad. The tester in the video complained about "twitchy" steering and the smallish front rack. I've seen some other tests that specifically said this Suzuki 450 ATV did not have steering problems. I read a ton of owner surveys and saw almost no complaints from any of them about this. If that is a concern for you, try to get a test ride and see for yourself. 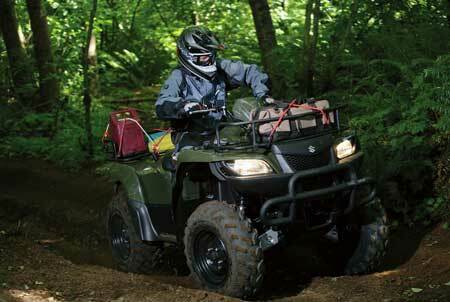 You can always take a look at the new King Quad 500 that comes with power steering. Problem solved - for several hundred dollars more! One thing that did get mentioned by more than a few owners and testers - the fiddly plastic panels that have to be removed for any kind of maintenance. These things are really a pro and con kind of deal - keep the muck out of the running gear and make it easier to wash - then curse the things when you have to take 'em off. Owners love the 450 KingQuad. So is this Suzuki 450 ATV a best buy? We think so. Where else can you get a well sorted, reliable, capable, comfortable, sport utility ATV with all these features for a real world street price well under $6,000? Our recommendation for a super deal is to find a rebate offer on one of the older models. There have been no significant updates on the 450 King Quads since they came out in 2007. So you're not losing out on anything and you could save close to $1,000! Maybe more. CURB WEIGHT 672 lbs. (305 kg) Dry - 606 lbs. Return to Suzuki ATV Guide from Suzuki 450 ATV Review - Information you want about this ATV innovation leader.